The important things that count in life: What do you know about the Holy Spirit? "For our sake He made Him to be sin who knew no sin, so that in Him we might become the righteousness of God. 2 Corinthians 5:21". Therefore, if any one is in Christ, he is a new creation; the old has passed away, behold, the new has come. 2 Corinthians 5:17". Brethren are you living in righteousness and in His nature. But also daily pray, read the Bible, and practise it too. I have often said spend more time in getting to know God’s words directly, read the Bible more.. and do not rather read what the still mostly liars do say about the Bible, and anything else they say. Men’s opinions are useless to God’s real, whole truth still too! Let God interpret, teach you his word and not the mostly mere, useless men and women. Stop praising mere men and women, praise God and worship him alone.. and you will know the truth and the truth will set you free. James 1:19 Wherefore, my beloved brethren, let every man be swift to hear, slow to speak, slow to wrath:20 For the wrath of man worketh not the righteousness of God.21 Wherefore lay apart all filthiness and superfluity of naughtiness, and receive with meekness the engrafted word, which is able to save your souls.22 But be ye doers of the word, and not hearers only, deceiving your own selves.23 For if any be a hearer of the word, and not a doer, he is like unto a man beholding his natural face in a glass:24 For he beholdeth himself, and goeth his way, and straightway forgetteth what manner of man he was.25 But whoso looketh into the perfect law of liberty, and continueth therein, he being not a forgetful hearer, but a doer of the work, this man shall be blessed in his deed.26 If any man among you seem to be religious, and bridleth not his tongue, but deceiveth his own heart, this man's religion is vain.27 Pure religion and undefiled before God and the Father is this, To visit the fatherless and widows in their affliction, and to keep himself unspotted from the world. Matthew 12:43 When the unclean spirit is gone out of a man, he walketh through dry places, seeking rest, and findeth none. 44 Then he saith, I will return into my house from whence I came out; and when he is come, he findeth it empty, swept, and garnished.45 Then goeth he, and taketh with himself seven other spirits more wicked than himself, and they enter in and dwell there: and the last state of that man is worse than the first. The Bible teaches that everything done by God was done by the power of the Holy Spirit, from the roses to the stars, from the butterflies to the ants… Everything done by Jesus was done by the power of the Holy Spirit, his Incarnation, his miracles, even His Crucifixion ((Luke 1:13 KJV) But the angel said unto him, Fear not, Zacharias: for thy prayer is heard; and thy wife Elisabeth shall bear thee a son, and thou shalt call his name John.14 And thou shalt have joy and gladness; and many shall rejoice at his birth. 15 For he shall be great in the sight of the Lord, and shall drink neither wine nor strong drink; and he shall be filled with the Holy Ghost, even from his mother’s womb. 16 And many of the children of Israel shall he turn to the Lord their God. 17 And he shall go before him in the spirit and power of Elias, to turn the hearts of the fathers to the children, and the disobedient to the wisdom of the just; to make ready a people prepared for the Lord. Acts 1:7 And he said unto them, It is not for you to know the times or the seasons, which the Father hath put in his own power. 8 But ye shall receive power, after that the Holy Ghost is come upon you: and ye shall be witnesses unto me both in Jerusalem, and in all Judaea, and in Samaria, and unto the uttermost part of the earth. Yes under the New Covenant, the Holy Spirit filling scenario is different from the Old Testament. Of course, submission to God, yielding to the working and guidance of the Holy Spirit are important issues in our lives, but being baptized with the Spirit or having the fullness of the Spirit is not merely yielding to the Holy Spirit already dwelling in the heart of the believer. It is the Holy Spirit coming upon the believer and filling him, empowering him, changing him. It is God’s intention for all His children to be indwelt by the Holy Spirit, continually filled with the Holy Spirit, and be led, taught and empowered by the Spirit in every aspect of their lives. Sadly, many of God’s children are not filled with the Holy Spirit. This has significant implications on their spiritual growth and their contribution to the advancement of God’s kingdom. If you have it you would know for sure, it would have changed your own personal Christian life dramatically. There are various reasons for their neglect of the ministry of the Holy Spirit, such as being ignorant of this area of truth and being over-reliant on personal capabilities, unrepentant sins, and effort to work out their faith and the excesses of those who over-emphasize of their inflated egos still. The Scriptures still clearly exhorts all believers to be Baptized now and to be personally filled with the Holy Spirit. Ephesians 5:18: “Be filled with the Spirit”. Why would there even be a need to be filled if you had it already now? Jesus promises us that he will Baptize us with the Holy Spirit and Paul’s exhortation in Ephesians 5:18 makes it clear that even though it is also still God’s intention for all to be filled with the Spirit, not all are filled nor Baptized, and Paul’s exhortation implies that we can do now something about it. So have you personally now you been Baptized with the Holy Spirit and even filled with the Holy Spirit again? and so now the devil uses any of his followers, those many still in the fundamental religious circles too now, to now lie, twist, distort the truths. And everything good done by any human being since the beginning of times, has been done by the power of the Holy Spirit; all your good deeds were done with the power of the Spirit of God, even if you never heard about Him!… the Holy Spirit is the person who moves the universe and your life… if you let him. and as we look at other passages in the Book of Acts that describe how believers were filled with the Holy Spirit. For example, when Peter preached to Cornelius and those who were with him, the Holy Spirit fell upon all those who were listening to the message and they received the gift of the Holy Spirit (Acts 10:44-45). Still by the power of the Holy Spirit only are we doing the will of the Father… It is the Father who gives the order, who wants it. It is the Son who becomes man. And it is the Holy Spirit the one who does the job (Lk.1:26-38). 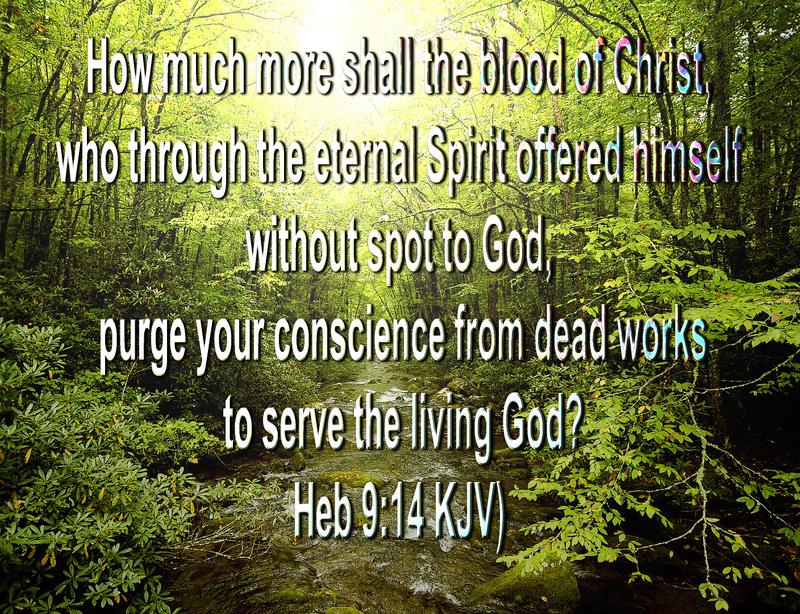 ((Heb 9:14 KJV) How much more shall the blood of Christ, who through the eternal Spirit offered himself without spot to God, purge your conscience from dead works to serve the living God? ). - Jesus was born by the power of the Holy Spirit ((Luke 1:35 KJV) And the angel answered and said unto her, The Holy Ghost shall come upon thee, and the power of the Highest shall overshadow thee: therefore also that holy thing which shall be born of thee shall be called the Son of God. ). - He went about doing good and healing all the oppressed by the devil, by the power of the Holy Spirit (Acts 10:38 KJV) How God anointed Jesus of Nazareth with the Holy Ghost and with power: who went about doing good, and healing all that were oppressed of the devil; for God was with him. ). - All his ministry was done anointed by the Holy Spirit ((Luke 4:18 KJV) The Spirit of the Lord is upon me, because he hath anointed me to preach the gospel to the poor; he hath sent me to heal the broken hearted, to preach deliverance to the captives, and recovering of sight to the blind, to set at liberty them that are bruised, ). - He was crucified moved by the eternal Spirit ((Heb 9:14 KJV) How much more shall the blood of Christ, who through the eternal Spirit offered himself without spot to God, purge your conscience from dead works to serve the living God? ). - The Spirit raised Jesus from the death ((Rom 8:11 KJV) But if the Spirit of him that raised up Jesus from the dead dwell in you, he that raised up Christ from the dead shall also quicken your mortal bodies by his Spirit that dwelleth in you. ). - And actually, the Holy Spirit is the one who leads the Church and your life and mine ((John 14:15 KJV) If ye love me, keep my commandments. 16 And I will pray the Father, and he shall give you another Comforter, that he may abide with you for ever;17 Even the Spirit of truth; whom the world cannot receive, because it seeth him not, neither knoweth him: but ye know him; for he dwelleth with you, and shall be in you.18 I will not leave you comfortless: I will come to you. (John 16:7 KJV) Nevertheless I tell you the truth; It is expedient for you that I go away: for if I go not away, the Comforter will not come unto you; but if I depart, I will send him unto you. 8 And when he is come, he will reprove the world of sin, and of righteousness, and of judgment: 9 Of sin, because they believe not on me;10 Of righteousness, because I go to my Father, and ye see me no more;11 Of judgment, because the prince of this world is judged. 12 I have yet many things to say unto you, but ye cannot bear them now. 13 Howbeit when he, the Spirit of truth, is come, he will guide you into all truth: for he shall not speak of himself; but whatsoever he shall hear, that shall he speak: and he will show you things to come. 14 He shall glorify me: for he shall receive of mine, and shall show it unto you. ). - All the Bible was inspired by the Holy Spirit, and that’s why it is the Word of God, to guide and help in the sanctification of all of us ((Heb 4:12 KJV) For the word of God is quick, and powerful, and sharper than any twoedged sword, piercing even to the dividing asunder of soul and spirit, and of the joints and marrow, and is a discerner of the thoughts and intents of the heart. (2 Pet 1:21 KJV) For the prophecy came not in old time by the will of man: but holy men of God spake as they were moved by the Holy Ghost. ). The Holy Spirit is usually mentioned last in the Trinity, and some people wonder if this doesn’t imply inferiority: Not at all!. The usual placement of the three persons of the Trinity has nothing to do with their importance, but with the order or chronology in their functions: The Father created us, the Son redeemed us, and now the Holy Spirit does his work in this age of the Spirit ((1 Pet 1:2 KJV) Elect according to the foreknowledge of God the Father, through sanctification of the Spirit, unto obedience and sprinkling of the blood of Jesus Christ: Grace unto you, and peace, be multiplied. ). Thus we pray to the Father through the Son and in the power of the Holy Spirit. The New Testament scriptural presentation is that there two events, the baptism with the Holy Spirit and being filled with the Holy Spirit. Those who are baptised with the Holy Spirit experience being empowered, equipped by the Holy Spirit. . Thus the “Baptism with the Holy Spirit” is a reference to the experience when Christ baptizes us with the Holy Spirit whereas “being filled with the Spirit” describes the holy Spirit’s prescence in our lives.. And so, when we are baptized with the Spirit, we are also filled with the Spirit but we also do have to be refilled but this is not so with the baptism with the Holy Spirit . This understanding of the two expressions is consistent with the scriptural presentation of the experience of the fullness of the Spirit when one is baptised with the Spirit and Paul’s injunction in Ephesians 5:18 to be filled and continue to be filled with the Holy Spirit. The injunction implies that a believer may or may not have experienced the gifts, empowerment, equipping of the Spirit and there are those who have must take care that they continue to be filled. The original text of Ephesians 5:18 has the sense “be filled and continue to be filled”. It is meant to be a continuing reality, not just an experience at a moment in time.The fullness of the Spirit is a reality that we need to maintain if we have already been Baptized personality by the Holy Spirit.